Event Espresso provides an easy way to import basic events via a CSV (spreadsheet) file. This will not allow you to import recurring events. Recurring events can be created using the Recurring Events Manager add-on. The Import Events button is located in the Event Overview page, below the event list itself. Clicking this button will take you to the import screen. Here you can download a copy of the sample spreadsheet you can use to create your own and import the actual spreadsheet. event_cost The event price, do not use currency symbols! additional_limit Group size, use numbers only. conf_mail Add the content of your confirmation email here, basic HTML and email tags are allowed. Save the spreadsheet as a CSV file named events.csv. Any other name or format will fail to import! 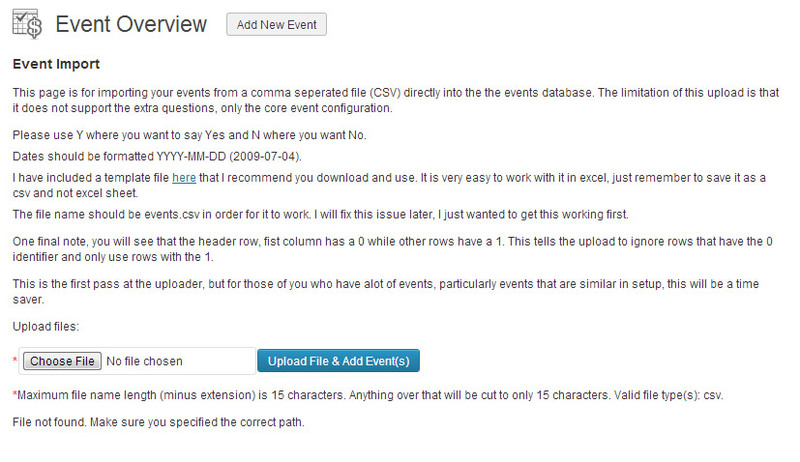 In the Import Events page, click the Choose file button, and select the newly saved events.csv file. Then click the blue Upload File & Add Event(s) button. You will see a message on screen confirming success or failure. Please note that the use of single quotation marks ( ‘ ) and returns (pressing enter to make a new line) should be avoided in the import file as these can cause errors.